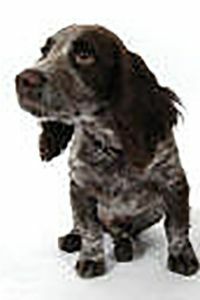 Based in Abigail’s office, Biggles meets and greet clients in reception with a waggy tail. He is also to be found wandering around salerooms looking for doggy treats and has been known to “liberate” the odd sandwich out of a bag. However, his main role is to feature in our auction catalogues. He has a loyal following of people who “Biggle-Spot” in the catalogues – if you would like a catalogue please contact Barbara “Bubbles” Benney our receptionist.